At DigitalOcean, our vision has always been to build a platform that allows developers to run their infrastructure at scale without getting in their way. To date, the top feature request from our community has been to have the ability to add additional disk space to their Droplets. Today, we are excited to introduce Block Storage to make that possible. Over the past few months, our product and engineering teams have been working to deliver a storage service that is as simple and intuitive as our compute, the Droplet. With the help of more than 15,000 beta users, we have designed an experience that is focused on reducing friction and allowing you to scale with ease. With Block Storage, you can now scale your storage independently of your compute and have more control over how you grow your infrastructure, enabling you to build and scale larger applications more easily. 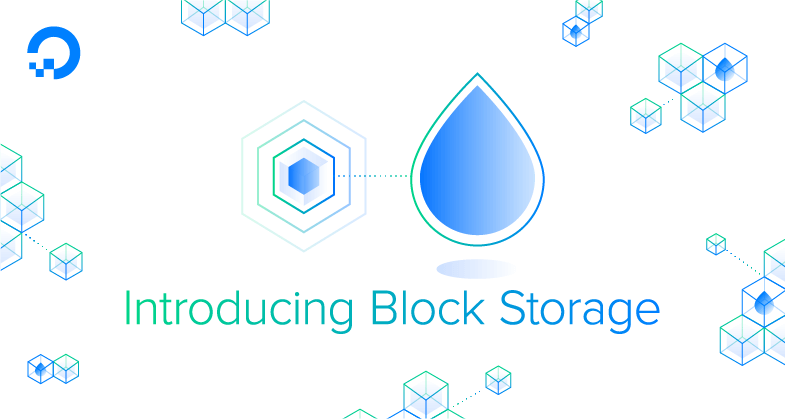 Like the Droplet, Block Storage is SSD-based and has an easy-to-use API. Our pricing model is straightforward, based only on capacity: $0.10/GB per month. There are no complicated formulas necessary to determine your overall cost. Block Storage stores data on hardware that is separated from the Droplet and replicated multiple times across different racks, reducing the chances of data loss in the event of hardware failure. You can easily scale up and resize your Storage volumes from 1GB to 16TB and move them between Droplets via the control panel or API. As your storage needs grow, you can expand an existing volume or add more volumes to your Droplet. All the data is encrypted at rest and transmitted to the Droplets over isolated networks. You can create Block Storage volumes right now in NYC1 and our new SFO2 region. FRA1 is next in line and will be available in the coming weeks. We're working quickly to expand to other regions. More updates to come. Update: As of Monday, August 1st Block Storage is now live in FRA1! Stay tuned for more updates as it rolls out across our regions. Once you have a volume attached to your Droplet, use the simple copy and paste instructions displayed on your dashboard to configure it. 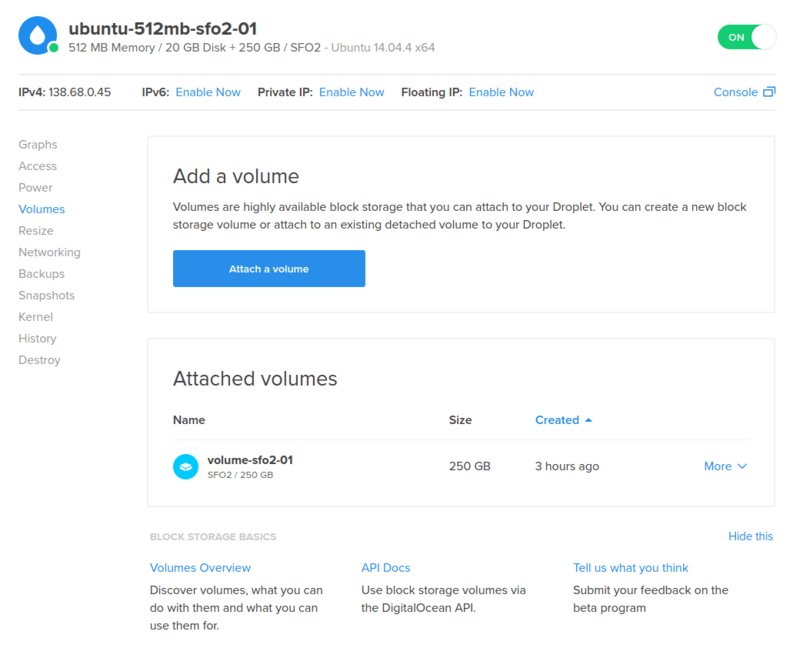 For more information on working with your Block Storage volumes, read our community tutorials about Linux filesystems and tools and our introduction to Block Storage. 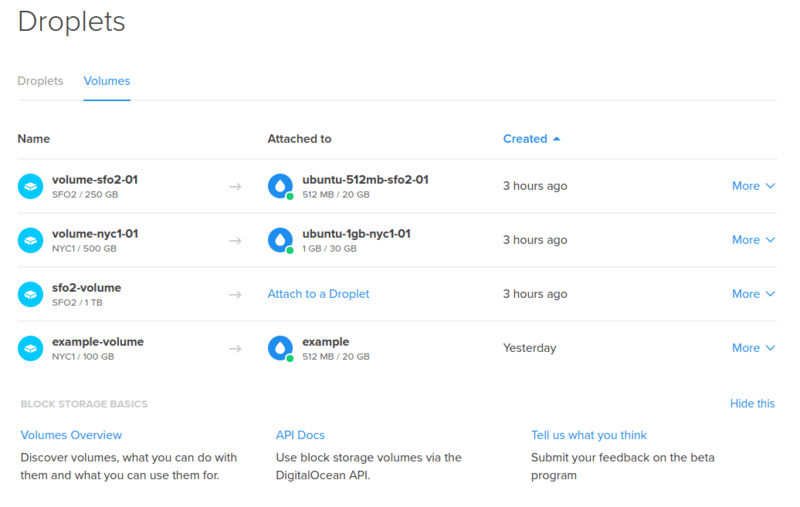 Like all DigitalOcean resources, you can also automate provisioning using our brand new volumes API or doctl, the official DigitalOcean command-line client. The whole team at DigitalOcean would like to thank all the beta testers who helped shape Block Storage and everyone who continues to provide feedback and offer suggestions. There is so much more we are excited to share with you in the future as we continue to strive to simplify infrastructure.